Recently I got one very good lens the Asahi Takumar 135mm 1:2.5. This is fast telephoto lens and from my point of view a good lens should be with aperture from 1:1,2 to 1:2,8. All other stuff of 1:3.5 and above is crap that was not well enough designed to provide a fast aperture. You can always close the blend if you need less aberrations and more accurate focus, but the fast aperture give you color saturation and much higher limited magnitude and resolution for astrophotography. 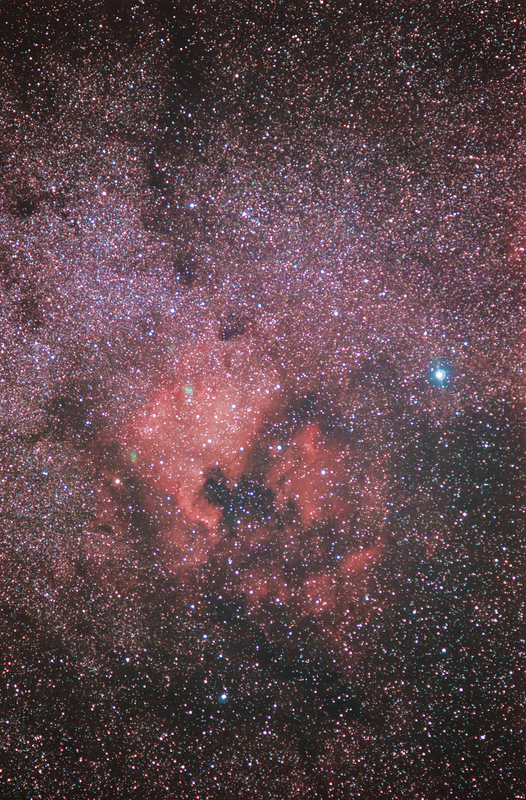 This is image of North America and Pelican nebula with Pentax k-5, ASAHI Takumar 135mm 1:2,5. 100x30s, ISO 25600, UHC-S filter. On this image DDS calculate 50193 stars till 9th magnitude. Those are the closest neighbors at that small area of the milky way! 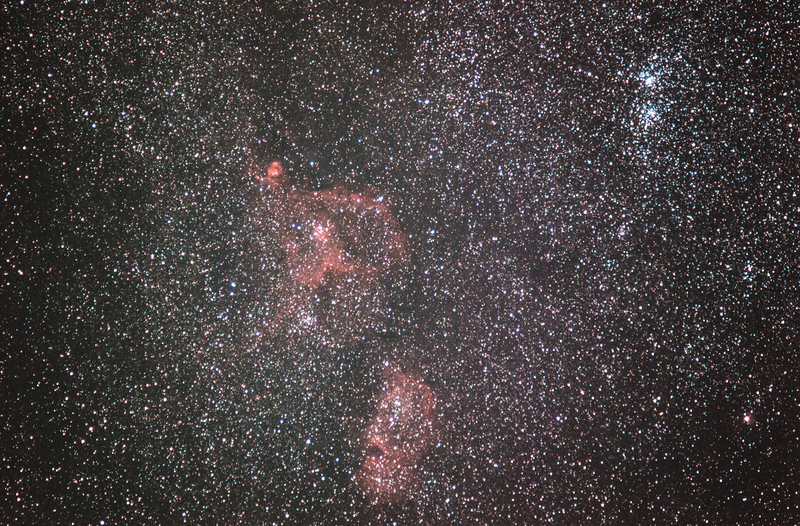 It is 10×6 degrees of the sky, 5x magnification and 7 seconds per pixel resolution. Some info from Wikipedia: “The North America Nebula and the nearby Pelican Nebula, (IC 5070) are in fact parts of the same interstellar cloud of ionized hydrogen (H II region). Between the Earth and the nebula complex lies a band of interstellar dust that absorbs the light of stars and nebulae behind it, and thereby determines the shape as we see it. The distance of the nebula complex is not precisely known, nor is the star responsible for ionizing the hydrogen so that it emits light. If the star inducing the ionization is Deneb, as some sources say, the nebula complex would be about 1800 light years distance, and its absolute size (6° apparent diameter on the sky) would be 100 light years.